Can’t I Cantilever? Yes, you can! Katsuhiro Otomo uses this one trick so well that it’s baffling others haven’t made it a comic book staple like speed lines, excessive exclamation marks and pointy shocked speech balloons. Perhaps it is merely because he employs it so deftly as to be almost undetectable until your right in the thick of it. 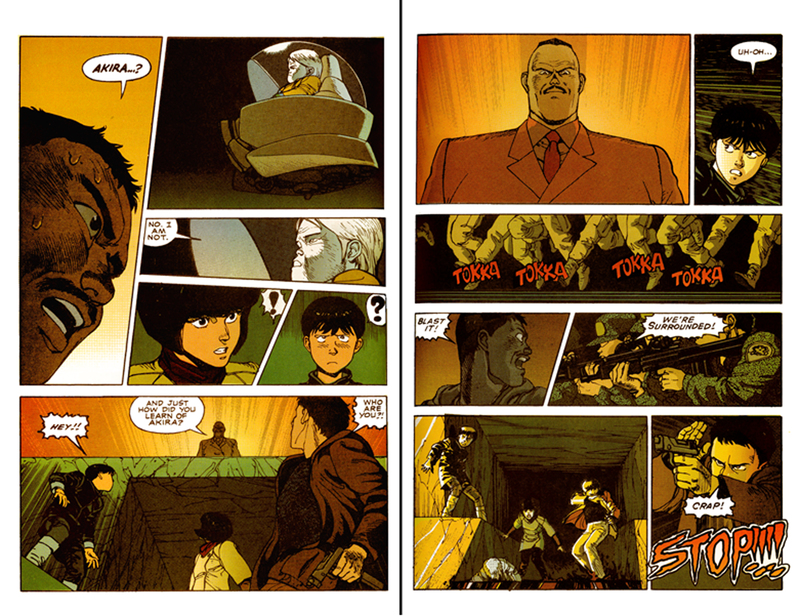 art: Katsuhiro Otomo colors: Steve Oliff book: Akira publisher: Epic Comics © Kodansha Ltd.
Now that’s awesome! Notice how at first he just slants the verticals to enhance the intensity of a character’s gaze? Check out the directions of everyone’s eye-lines on the first two pages. The “he’s looking here but I’m looking there while she’s looking right and they’re running left” quality just enhances the overall bedlam of the scene. You can see this pot is about to boil! When I was in Japan, I had a very long and fascinating conversation with Naoki Urasawa, the creator of Monster!, about Otomo’s use of his character’s gaze. Urasawa found this usage, leading the reader across the page from panel to panel, very Western. He cited this as further example that Otomo was affected to the core by European and American comics and film, not just in the superficial trappings of his style (which obviously owes much to Frenchman Jean “Moebius” Giraud.) By contrast, he showed me that most homegrown manga had the character’s eyes always facing out towards the viewer. He attributed this to the filmic style of Yasujiro Ozu, director of Tokyo Story. He said it was Ozu’s belief that the character should not avoid looking at the camera, but rather face it directly. The camera is always the first-person subjective point-of-view, he claimed, and therefore the characters should address it as a means of telling their stories directly to the viewer. Be that as it may, I think traitorous Otomo nails the tension of this scene by opting for the every-which-way approach. You can feel how surrounded everyone is, so when Kaneda finally breaks the crisscrossed tension with a beautiful frozen profile kick in a nice long trapezoidal panel, you welcome the catharsis to come that will release you from this fever pitch suspense. And come it does with Otomo’s brilliant command of his angular panels. I trimmed a page or two in which the whole place starts to collapse, but you can see that just from the pitched “rooftop” of the panel in which the floating wheelchair kid reaches desperately for his friend. That page finishes in perfect angled fan slices that emphasize the action of the bouncing pill. 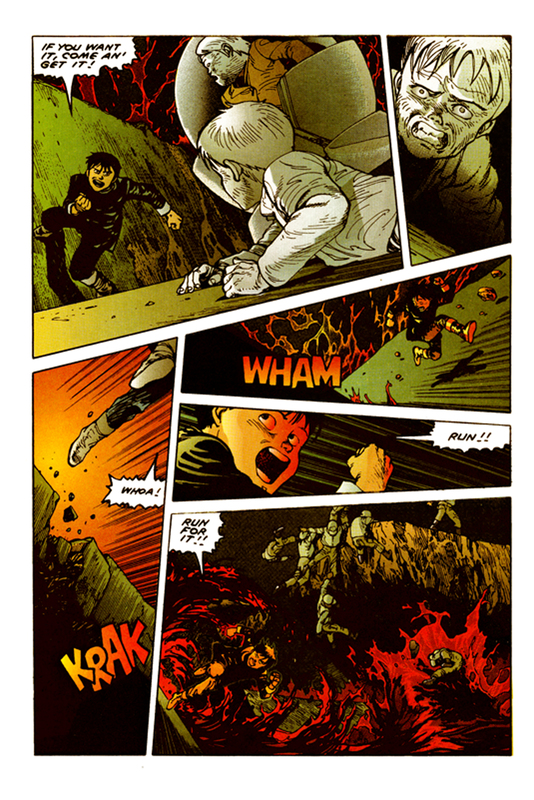 And the final page is the most dexterous, with Kaneda nearly pushing his weight off the side of the panel itself to spring to safety. Notice how his push is always from the left, his run to the right throughout the whole page. Again, the tilts are brilliantly employed to suggest his changing balance in this cat-like escape. I’m loving this blog (linked here by Sean) — you’re teaching exactly the stuff (and in exactly the way) I’ve always wanted to teach. Looking forward to more! By the way, it’s awesome that you’re using the Marvel Oliff AKIRA, now (alas) probably lost forever. His color job never ceases to impress me… especially considering the time. Thanks so much for the support. I keep in touch with my former roommate Sean through his blog daily. It’s fantastic stuff, isn’t it? He’s a little more interested in the story side of comics than I have ever been, but his appreciation and understanding of the art side is more evident everyday. I’d love to do a magazine on comics with him where we split the reviews into story and art to play to our strengths…maybe some day! My scanner bit it the other day so posts were interrupted. However, I’m staring at my beautiful new Epson, so expect more tonight. My class needs some info on character design. I’ve always loved Oliff’s colors, and they seem so suited to Akira. I mean Domu really doesn’t need anything more. Even moody colors would take away from its creepiness. And if you’ve ever had the pleasure of seeing any of Otomo’s early short story work, in particular one in which a murderer has a moment of clarity seconds too late, I think you would agree color would spoil the starkness of the narrative. But Akira is widescreen in all respects. Baba O’Reilly meets Clockwork by way of Moebius needs color — if only to keep all the character’s straight over its thousands of pages. I only wish I had the full Epic run. Oliff was really ahead of his time in terms of how he used computer colors. When Youngblood and WildC.A.T.s debuted at Image, everyone noticed, “Hey, those are a lot of colors on a page! Lookit how they do that.” But Brian Murray’s colors were hideous pastels, which became the house style for a bit (thanks, DIGITAL CHAMELEON (you can’t make that up! )), and I never loved Joe Chiodo’s omnipresent pinks. I’d rather see Jim Lee colored by Joe Rosas WITHOUT a computer like he was back on Uncanny. Rosas and others seemed overwhelmed by the choices Photoshop gave them, so they threw EVERY color in with meaningless gradients everywhere. But Oliff never lost his design sense and beautiful palette. I would say the biggest reason people had to sit up and take notice of fledgling Image Comics was because suddenly overly-worshiped Todd McFarlane’s pages actually looked beautiful — and it was because Oliff gave them some mood that fit the tone of the setting and “story”. Suddenly all Todd’s absurd and superfluous tiny marks which cover absolutely everything were hidden by tone and made to blend into the overall image. Those gorgeous contrasting warm oranges and heavy blues gave Spawn an atmosphere McFarlane aimed for with his “serious” and adjective-less Spider-Man which always sported gaudy colors with giant white spaces between. Oliff made the whole work hang together, because, honestly, one should not be trying to find minuscule spiders or Felix the Cat, or considering whether EVERY damaged wall would really have plumbing in it when reading a comic. One should be READING. Oliff let us do just that on Spawn. (In retrospect, maybe he shouldn’t have.) And in the case of Akira, he added even more smarts to a book that wasn’t hurting for them in the first place! What ana amazing article, I love the detailed analysis beyond the common “style”/story/amazing “camera angle” approach, and more into the whole distribution of the page. I do have a question, though, since Akira is still manga, and Japanese manga books are read from right to left, weren’t the pages mirrored when transitioning the book to the colored western edition? When you say “Notice how his push is always from the left, his run to the right throughout the whole page.” could that be a result of mirroring? I heard that sometimes mirrored things just don’t look well (flags, for example) and those panels have to be left as they used to be for the new diagram. Thus altering the whole comic book design. I am seriously just asking this like, out of curiosity, because all that I’ve said before I’ve known from unreliable sources, and since you’ve taken the time and effort to analyze the material longer/harder than me (I only own Vol. 1…) I thought maybe you could enlighten me on that topic? If it’s not a problem, of course! Thanks for the insightful question. Yes, Japanese comics have the opposite read of American comics. The read is from right to left. Typically, the entire page used to be flipped for translation if there was more than one panel on any given horizontal tier. If every panel covers an entire tier, there is no necessity in flipping the page because both cultures read from top to bottom. Occasionally, panels were flipped individually if, as you indicated, there was graffiti on the side of a building or any sort of large writing in the background. Sometimes pages were invariably flipped if, let’s say, the main character had an eye patch (more common than you might think). These days, most manga is reprinted with the original reading direction. It saves so much time and teenagers seem to think it’s cool and unique, like watching undubbed manga with fan-subs. 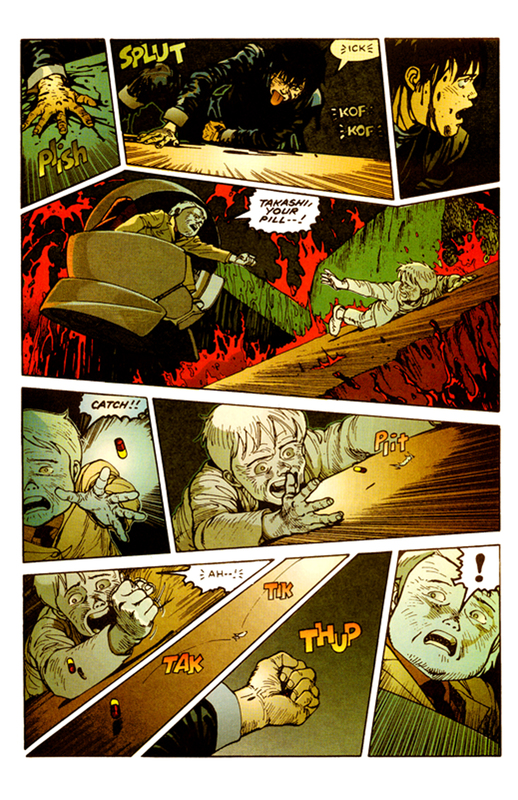 As for these Akira pages, I can safely say they must have been flipped as a whole. There is more than panel per tier, and they could not have been individually flipped due to their unique interlocking shapes. Does that mean Kaneda was originally pushing from the right and his run to the left throughout the whole page? Yes, but the point remains. Otomo is keeping track of where he is on the page, and the run is in the direction of the read, no matter which language we are in! I hope you aren’t trying to credit Otomo with the creation of this widely used technique. Finding a shonen manga from the 70s or 80s that doesn’t use it to some degree would be the trick. Some American artists have done it as well. Richard Corben comes to mind (there’s an comic-book artist worthy of much study). I think I first caught this when admiring Tsuguo Okazaki’s work in his 80s series Justy (ジャスティ). For an artist who didn’t seem to have a lot out there, I was impressed by the quality of his work on many levels (the story was shonen sci-fi superhero fluff, but that hardly matters). 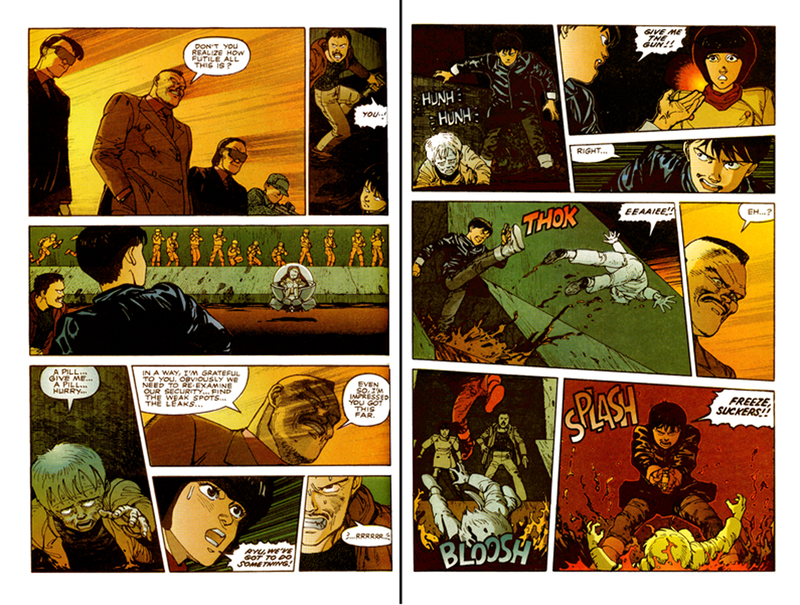 I recommend looking at Justy for contrast on the technique to what you cite from Akira: Otomo’s pages actually seem to struggle and stutter when things get very off-balance, while Okazaki’s variance is fluid, with slanting gutters still contributing to a smooth flow of the eye through the sequences of panels. It should be easy to find the (abbreviated) English translation by Viz — I’ve even seen scans of it floating around the back alleys of the internet. Long time since you posted this, but people are always studying manga right! Anyway, nice piece and I just wanted to agree with the one line commenter above re: panels – it’s very Tezuka. The rigidity giving way to the slanted panels and finally a fractured page layout was something Tezuka did a lot.